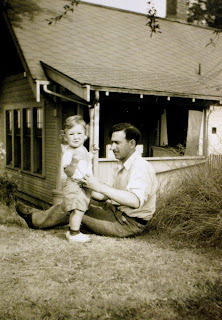 Pop and Mom 1935. Dad was park Ranger at Grand Tetons National Park. Mom circa:1934 a few years before I came along. 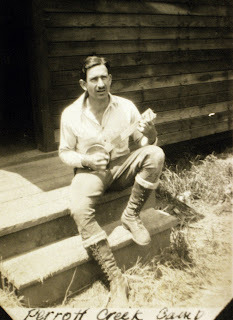 Pop strums the ukulele banjo at a lumber camp in the 1920's. Pop, Phip, baby Ken, 1937. 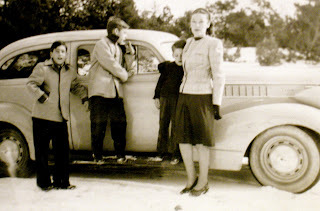 Christmas 1946 Mom with 3 boys, Phip,Spike,Billy. The three brothers, Billy,Phip,Spike... in their new sweaters knited by Mom. photo shot by "Pop" in Santa Fe, New Mexico. Four nephews from my brother Phil (frnt)Ken,Phil,(bk)Andrew,Duncan,Dion.